For five weeks now the Web Summit and the spat with the Irish Government has been high on Ireland’s news agenda. And it almost seemed like the issue was going to offer even more headlines on Friday when it was announced that Mr Cosgrave was going to appear on RTE’s most popular current affairs programme The Late Late Show. But it seems the headline hunters will have to look elsewhere. It all began back on September 23 when the Web Summit announced its next chapter, that it was moving from Dublin to Lisbon for 3 years saying it was part of the journey to international growth. The government were ‘disappointed’ but the narrative was it was a natural progression. But the Summits founder mentioned in media interviews throughout the day that it has been no secret they had been looking at other locations. And the media sniffed a good story. Why had the Government not done more to secure the event? There was much musing about what might have caused the move and what could and should have been done. Fast forward to October 15 and things got more concrete. 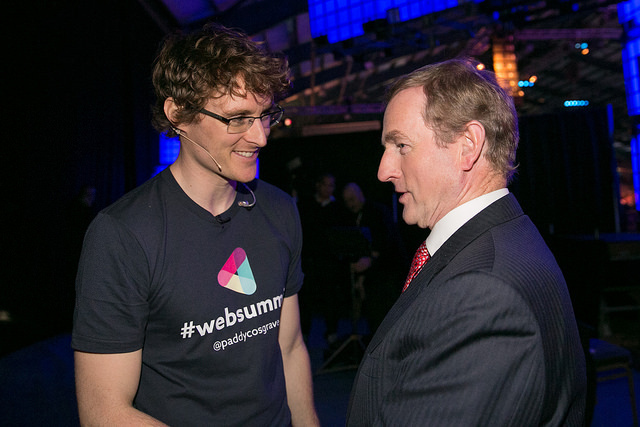 Web Summit CEO, Paddy Cosgrave, released the correspondence between the event’s organisers and the Government detailing the lead up to the move out of Dublin. It showed that organisers were frustrated with government efforts to facilitate the event and felt there had no option but to go elsewhere. The overwhelming amount of coverage was of the claims made by Mr Cosgrave which were derivative of the government, However The Irish Times pointed to a contradiction to the assertion there was ‘no support’ highlighting funding that the Web Summit recived, offering some balance to the equation. The RDS moved to defend their efforts stating that it was the WiFi issue was the Web Summit’s responsibility. Which later in the day was topped by an Taoiseach Enda Kenny was defending his position saying they has been supportive all along. The following days were littered with coverage of the contents of the emails with damage spreading even to The Department of Agriculture. On the other side, ministers issued defenses of their efforts. But with the opposition taking the opportunity to have a pop too, it didn’t stack up well for FG/Lab Government. By the 18th Enda Kenny and government ineptitude was to blame. And in the two weeks between then and the start of the Web Summit the press has been analysing and dissecting the emails, we well as the events and the impact of the move. And as the Web Summit celebrated, the tension between the organisers and the Government reached boiling point. Reports that Enda Kenny only received an official invitation as the last minuet was met with a reminder of an open invite and that no other government had been officially asked to attend. Later, borne out of mounting frustration Mr Cosgrave adding more scathing remarks and saying the money received from Government was nothing but hush money. Prompting a juvenile response that it should be returned. All the while the Web Summit, despite being dogged by WiFi isues and some complaints about expensive food, it has had some outstanding moments. It is not clear what might have been achieved by Mr Cosgrave appearing on the Late Late show. It certainly would not have put the issue to bed as the interview and the following responses would no doubt provide more news fodder. The Government’s next chapter is into an election, the Web Summit’s next chapter is in Portugal. But, the thing about chapters is that after chapter two, you don’t usually return to chapter one. And for now, for the Web Summit, this one seems closed. The Late Late show appearance would have only provided a needless ‘to be continued’. Previous Denis O’Brien is part of a tentative three-way bargain that upholds our press freedom.